On April 22nd, over 50 seniors and people with disabilities demonstrated in front of the San Francisco Association of Realtors offices to protest the group’s opposition to state Ellis Act reform. The demonstration, organized by Senior and Disability Action, highlighted the increasing evictions of seniors and people with disabilities in the City. 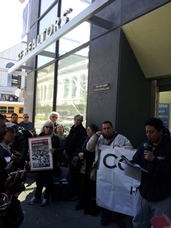 Activists there introduced a list of thirty serial evictors of seniors and people with disabilities called “Ethel’s List” and demanded the SF Associations of Realtors stop lobbying against Ellis Act reform. Ellis Act reform has been making its way through both the state and local level, but has seen opposition from groups like the SF Associations of Realtors each step of the way. The rally targeted such real estate speculators directly because of the high number of evictions of seniors and disabled. These tenants are most often long-time residents with nowhere else to go. The rally raised questions of the ethics of real estate speculation, which does not pay attention to the livelihoods of those being evicted. Ellis Act evictions have increased 178% over the last three years, and seniors and people with disabilities face an enormous challenge to relocate once facing eviction. Multiple speakers noted that eviction of seniors often means death. Demonstrators demanded both a moratorium and end to senior evictions as well as the SF Association of Realtors to stop opposing legislation for Ellis Act reform. A group of seniors being evicted handed a representative from the SF Realtors that came down to address the group a letter. Kathy Lipscomb, a senior and organizer, read from the letter delivered. “We seniors gather today in front of your office to ask you to open your eyes, your ears, and your hearts to the plight of elders who have been evicted or who live in fear of eviction,” she said. Tommi Avicolli Mecca of the Housing Rights Committee spoke on the effects of homelessness on LGBT seniors. He quoted studies that found decreased life spans of homeless populations and the medical consequences of homelessness. The rally brought little media attention than what has been typical of recent actions on San Francisco’s housing crisis. Perhaps because rally was on the plight of seniors against real estate speculators and not the tech industry, so few press were in attendance. “We have to make sure we keep the word out there, that our seniors are protected, our youth also, and all of our families,” Erick Arguello of Our Mission No Eviction said. The next hearing for state Senator Mark Leno’s Ellis Act bill, SB 1439, which would restrict Ellis Act evictions from within five years of ownership, will be on Tuesday, May 6th in Sacramento. Realtors associations crowded the meeting on April 8th, and additional support from tenant’s rights advocates will be needed to push the legislation through.